La nature est parfois difficile avec ceux qui pour autant l'aime encore. Exemple confirmée à La Charpenterie. (Photo taken from a post by Sabrina Cyprien Caslot-Bourdin. Parts of the Loire were hit by a sharp frost early this morning with temperatures falling well below zero, with reports of temperatures as low as -6˚ in some places. My concern started late last night with reports of plunging temperatures, clear skies and photos of candles, frost pots, etc. out in the vineyards in an attempt to save the fragile vine buds. My concern grew at 5am BST when I saw photos on Facebook of thermometer temperatures down to -2˚. Worst fears were soon confirmed within a few hours. Today was the third day tasting Loire wines at The Decanter World Wine Awards. Although we tasted some very good wines, especially from the 2014 and 2015 vintages, the bad new from the Loire for the 2016 vintage was always at the forefront of my mind. It is difficult at the moment, and from a distance, to know how bad and how widespread this frost has been. 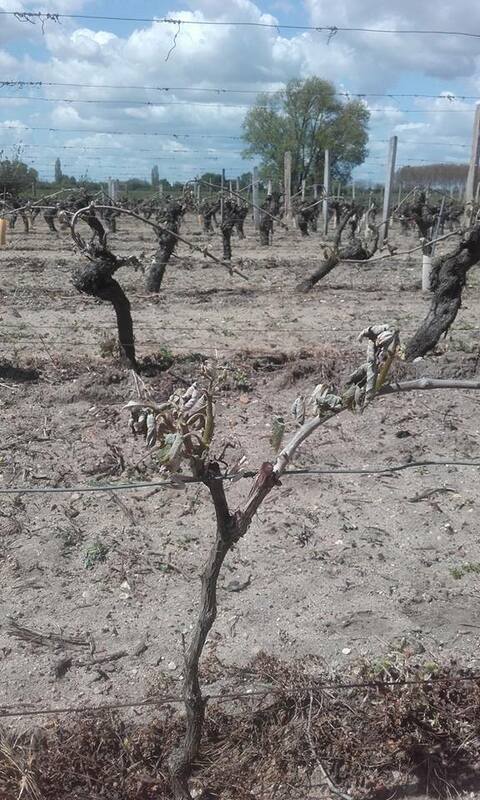 Certainly some vineyards have suffered catastrophic losses with the 2016 vintage already wiped out or virtually so. The damage appears to be worst in Bourgueil, Chinon, Saint-Nicolas-de-Bourgueil and Azay-le-Rideau. Reports also suggest that Vouvray, Montlouis and Noble Joué may have been badly hit. Vineyards in the Loir-et-Cher may have been less badly hit. In any case it will take a few days to really be able to evaluate the damage. Frost never comes at a good time but this year's frost, and there had been some frost damage during the night of Sunday/Monday 18th April, has come at a particularly bad time. There has been an increasing awareness that there are some very good things happening in the Loire and the wines are increasing in fashion. After a number of short vintages, especially 2012 and 2013, many Loire producers' stocks are low and finances already tight. Even 2014 and 2015 for many have not been over-generous – not helped by the ongoing losses to Esca, which typically may be 5-10% a year. Although it is a long time back, the stock situation in 1991 – the worst Loire frost in recent memory – may well have been better as 1990 was both a very good but also generous vintage. My thoughts are very much with my Loire vigneron friends this evening. 'Les vignobles en Indre-et-Loire des appellations Chinon, Bourgeuil et Saint Nicolas de Bourgeuil ont été durement touchés par des "gelées noires" dans la nuit de mardi à mercredi et "au moins la moitié de la récolte est perdue", selon les responsables du secteur. "C'est assez clairement une gelée historique, de l'ordre de celle de 1994, et peut-être de 1991", lorsque la presque totalité de la récolte avait été perdue sur ces appellations, a déclaré à l'AFP M. Guillaume Lapaque, directeur des associations viticoles d'Indre-et-Loire et de la Sarthe. "Tout l'ouest du département a été touché par des gelées allant de -3 à -4°, avec des pointes à -6°, alors que les vignes sont en plein débourrage (ouverture des bourgeons, ndlr), c'est à dire à un moment extrêmement critique", a-t-il précisé. 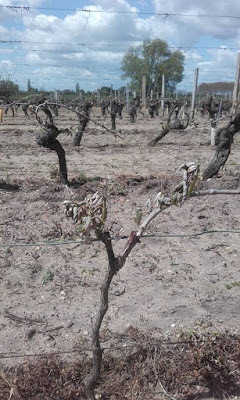 We visited a winery in Monthou-sur-Cher on April 16, and when the winemaker was showing us their vineyards, she said that the vines were ahead of schedule this year, and she was worried about Frost on Sunday night. I haven't heard how that went, or what happened there on April 26/27. Bob. Difficult to know. The Cher Valley appears to have been less extensively hit apart apaprently from Bléré, Civray and parts of Saint Georges. However, it may well be very variable. Sometimes, the roots can survive & come back. Keep watering them to see please. Unknown. It is not a question of the vine surviving – they will it is this harvest that has been either totally lost or partially lost.